3D space into two sets - think of it as solid (occupied) space versus empty space (air). radius (distance of the point in space from the point charge). the point where the charge lies, and drops off quickly as you go away from the charge. But no matter how far away you are from that point, it still has some contribution. Regardless, if you draw an isosurface about this point, you'll still get just a sphere. now form a blob, also known as a metaball. equipotential line, right? Okay, so now bring yourself back to the 2D (flat image) realm. with the vector to the light source, etc. ), plot the color, and move on to the next pixel. consider 50 spheres all separately - for each, we just solve a quadratic equation. and move on to the next pixel. own. And now I share it with you. code we'll just set q to zero when r > 0.707). of charges in the scene, and rendering time plummets. Ken Perlin came up with another nice basis function that works well for this purpose. One nice thing about this is that the range of r is from [0..1], rather than [0..0.707]. general "smoothing" function, for all kinds of purposes, even outside of graphics. g(0) = 0, and g(1) = 1. With blobs, we want g(0) ~= 1, and g(1) ~= 0.
or the range, and it will work (i.e. take g(1-r), or take 1-g(r)). zero-slope at both r==0 and r==1, and the symmetry about the center. Else ('exit' from bounding sphere): remove that charge from 'active' list. using the 'active' list as the point charges contributing to the field. that scales the contribution of the charge to the net electric field. You can also adjust the threshold. 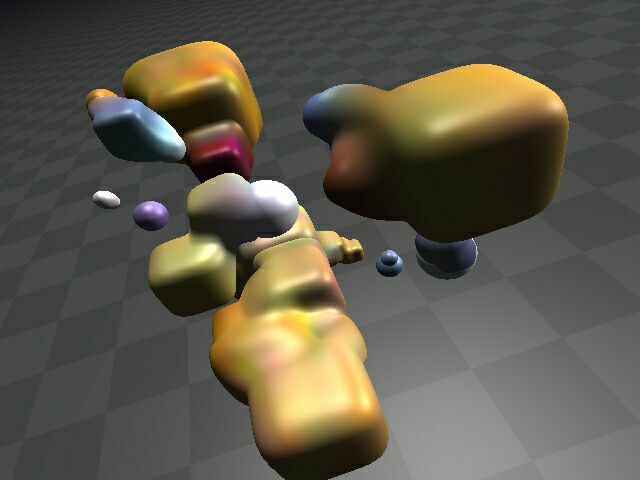 Remember, its function is to decide what is blob vs.
spheres, and a good 'blobbing-together' look. vector to the light source(s) and figure out the appropriate lighting. threshold value). Just look at the electric field contribution of each point charge, q(i). and voila, you have the normal. 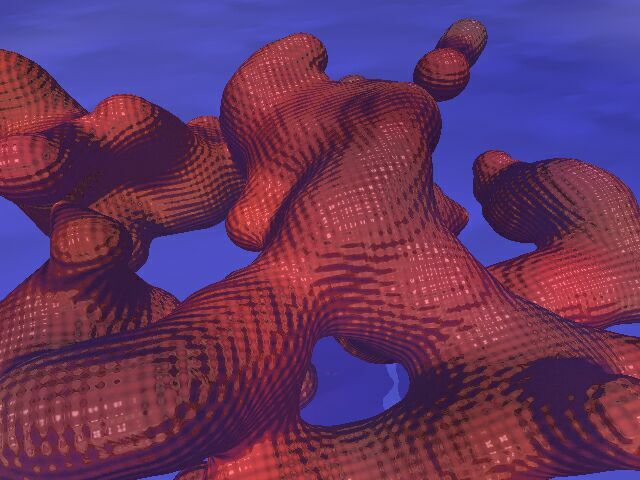 scalars, not vectors, this time) to smoothly vary the surface characteristics of the blob. amount of meat we eat so that fewer billions of animals are slaughtered each year. meat is important. Thanks for listening! magnitude of the current charge (blob node) under consideration. -> the spherical bounding test uses the radius (squared). -> the spherical bounding test uses the max radius (squared). basically, there's an "axis ring" whose radius is 'mag'. be more than 2x as big as it (untested circumstance). it gets the distance to it in y, and in x/z, then does a 2D distance on those. Slick! -> the spherical bounding test uses the radius 'mag + inner_rad'. -> this is followed by a clip at y=inner_rad and y=-inner_rad. // r_squared should be in the range [0-.500]. OTHER TIPS: * For fast tessellation using marching cubes, consider a surface-crawler. (This is what I used for Geoforms.) * For fast splatting, consider using an octree. (This is what I used for Lava aka Oozic.) 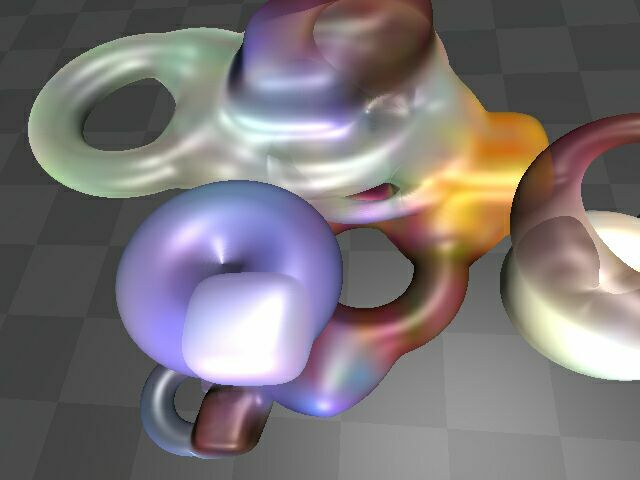 Back to Top Back to Raytracing This document and all images are copyright (c)2000+ Ryan M. Geiss. Please maintain credit to author upon citation or duplication.